VICTORIAVILLE, Que. – Joined by four percussionists, trombonist/composer George Lewis might have been expected to play something explosive, in keeping with the (false) image of Chicago’s Association for the Advancement of Creative Musicians (AACM). Instead, the 62-year- old Lewis, a Yale philosophy graduate, Columbia University prof. and 1992 recipient of a MacArthur “genius” grant, offered Calder, named, appropriately, for module sculptor Alexander Calder. 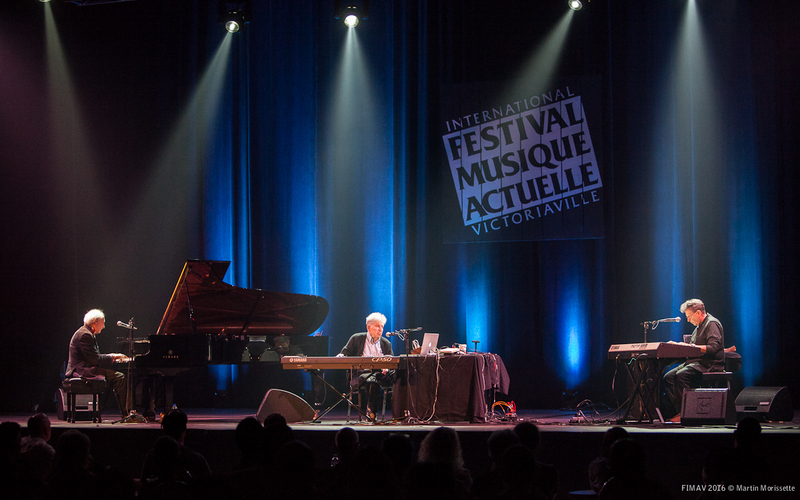 In excellent French, Lewis promised an early afternoon audience at the Festival de Musique Actuelle a meditative piece, befitting a glorious sun-filled afternoon in this placid, off-the-beaten track city, 100 miles northeast of Montreal. 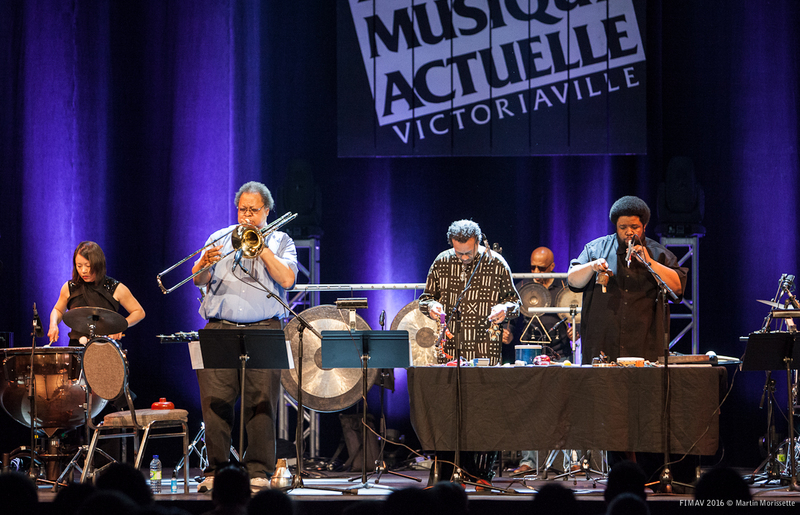 And like a Calder mobile, the piece, first played last year in Rome to mark the AACM’s 50th anniversary, was light and airy, balanced with the varied and unconventional sounds of a creative orchestra that strives to go beyond the linear. Lewis led off with a muffled wah wah sound on his trombone, as the percussionists joined in with such noisemakers as a gragger, gongs, scrapes on piano strings – the “bells-and- whistles” devices that are the tools of creative musicians. It was a truly participatory effort – a collective approach to a chart that allows and expects band members to be free, walking around the stage from one instrument to another and taking turns playing some of them. Band members were percussionists Thurman Barker, Eli Fountain, Tyshawn Sorey, who also played piano, and special guest, chamber musician Aiyun Huang, a percussion prof. at McGill University. The piece as played was an invitation to explore, but provided balance and integrity. Vibraphonist Barker played first without the sustain pedal, then with it, as part of the evolving first segment, as pianist Sorey intensified his piano offerings. Trombonist Lewis played without mouthpiece to get that Out sound. Later, musicians held up sheets of paper with notations for band members to see – the equivalent of road maps indicating where the music should go. From the tingle of the triangle to the reverberations of big drums, the musicians covered a broad sonic and emotional range – an hour-long exploration both unique and captivating. The next session was a double bill. First was a sound-and-light performance by Montrealer Myriam Bleau, who spins four acrylic tops equipped with gyroscopes and accelerometers connected wirelessly to a computer that feeds various data (speed, wobbling of the tops, and acceleration spikes) to musical algorithms. Light emitting diodes (LEDs) inside the tops illuminate the objects in counterpoint to the music. A camera from above provides a video feed – a pleasant if somewhat monotonous half-hour experience. Part II was Martin Messier’s Field, where sound from surrounding magnetic fields is generated from two panels of connection patches. His rumbling sounds, electric explosions, and flickering lights provided a somewhat more refreshing half-hour. The early evening feature was the drone-rock sound of Laniakea – Italian electric bassist Massimo Pupillo and British organist/vocalist Daniel O’Sullivan, with Canadian cellist Peggy Lee and violinist Jessica Moss. Its moody sound combined with O’Sullivan’s hard-to- make-out lyrics made for a murky outing. Much more interesting was the reunion of three American improvised music pioneers in Musica Elettronica Viva: composers Alvin Curran and Richard Teitelbaum, both 77, and pianist Frederick Rzewski, 78. Mixing the satirical and the serious, Curran at one point began playing notes from a ram’s horn, used typically in synagogues on the Jewish Day of Atonement, then picked up a few harmonicas to add sonic variety. Rzewski told the story of his grandfather being kidnapped by Cossacks in Galicia in 1914, never to be heard from again. “Now it’s 100 years later and the same thing is happening,” he intoned. The last of 25 concerts featured the post-rock group called Big Brave, with its saturation approach on slow to mid-tempo tunes. Wrapping it up, festival director Michel Levasseur declined to reveal figures for paid attendance, but judging from the crowds in the many hundreds for each of three concerts of John Zorn’s bagatelles, and good crowds in all the others, the attendance met expectations. *Juan Pablo Hernández & Rodrigo Dominguez. duo (guitarra / saxophone duo ). The music that ended the first night of Moogfest 2016 here late Thursday was patient and slowly evolving, an ambient blend of billowing sustained tones — floating in and out of dissonance — with the natural sounds of birds and insects, that was layered together onstage for nearly eight hours by the composer Robert Rich. There were passages that sounded like distant choirs and gentle patters of percussion; there were slow washes of harmonic tension and resolution. There was also another natural sound: audience members snoring.